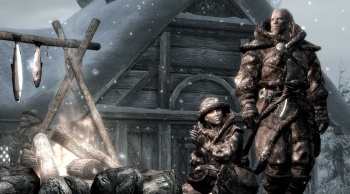 PlayStation 3 owners "should" finally get their hands on Dragonborn, Hearthfire and Dawnguard in February. You PS3 types have been waiting a long time for the cavalcade of Skyrim DLC that Xbox 360 owners have been enjoying since, oh, last summer, and now it's finally here! Well, almost. Probably. It's not quite carved in stone, but Bethesda seems pretty optimistic that you'll get your hot little hands on it in February. "Dragonborn will be the first add-on arriving on PSN in February. Hearthfire will release next, followed by Dawnguard, and all three should be out in February," the studio said. "The 1.8 update will also release, just prior to Dragonborn." Whenever it arrives, Bethesda will offer all three DLC packages at half-price during their first week of launch on the PlayStation Network. Yes, as you may have noticed, the order of release on the PS3 does appear to be reverse that of the Xbox 360, and no, I have no idea why, although I can't see why it would really matter in the grand scheme of things. You should just be happy you're getting it at all! Right? Bethesda also announced today that the PC version of Dragonborn, the third and latest DLC release for Skyrim, will hit Steam on February 5.